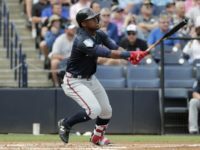 Taking a look around the league, here’s a recap of last night’s action and suggestions for your fantasy baseball team. Mr. Clutch (pitcher) – R.A. Dickey was ridiculous last night, tossing a two-hit, complete game shutout against the Rays. Desmond Jennings stole second base in the seventh inning and was the only batter to advance past second base on Dickey. Dickey definitely has struggled in transitioning from the NL to the AL, and this could be a good time to sell high on Dickey. He faces the Tigers next Monday. Mr. Clutch (hitter) – Mike Trout powered the Angels past the Tigers last night off of his two-run homer last night. He is rocking a .308/.384/.541 slash line with 13 home runs and 19 stolen bases on the season; basically being all that and a bag of chips. If you own Trout, expect elite numbers moving forward. Surprise, surprise! – Ichirio Suzuki filled the stat sheet last night going 3-for-4 with two runs, two RBIs, a home run and a stolen base. Suzuki has been on a tear the past week, which includes back-to-back games with a home run, along with a seven-game hitting streak. He is owned in less than 40 percent of leagues and is definitely worth a flier while he is hot. Here comes the heat – After last night’s two-homer performance, I think it’s finally time to start talking about Michael Cuddyer. Currently riding a 23-game hit streak and reaching base in 42 straight games, Michael Cuddyer has been an absolute delight this season. The 34-year-old slugger is having a career year and has been a fantasy stud. He has a .344/.396/.595 slash line along with 13 home runs, 35 runs, 45 RBIs and six stolen bases for the season. Left out in the breeze – Someone had to be the victim of A.J. Griffin’s complete-game shutout yesterday, and that was none other than Jay Bruce. In fact, I do not think he is a fan of playing the Athletics. The past two games he has gone 0-for-8 with six strikeouts. Luckily for Bruce and Bruce owners, the Reds are off today and take on the Rangers Friday. Who’s trending? – In 2011 this pitcher went 9-and-10 with a 3.74 ERA, a 1.10 WHIP and a 9.11 K/9. Do you know who this pitcher is? It is none other than Michael Pineda. After getting traded to the Yankees in 2012, he had season ending shoulder surgery. Finally, after almost a year and a half, he is back on the mound and could be a pitcher to keep your eye on. He looked sharp in his double-A rehab assignment with the only concern being the decreased velocity. Pineda is a young pitcher, so I expect his arm to bounce back from a scary injury, but the decrease in velocity is alarming. Hopefully this is just part of the recovery process and not a permanent thing. If you have the room, he is definitely worth a speculative stash on your DL slot. Challenge TTFB’s staff in a free fantasy baseball contest that nets $300 in cash prizes! Bench me, please? – Daniel Nava took fantasy owners on an enjoyable ride, but its time to cut bait on this young player. Though he has hit the ball in his last two outings, he has been struggling as of late at the plate. A slump plus losing regular at bats to Jonny Gomes ruins Nava’s fantasy value for 12-team mixed leagues. Someone like Suzuki will be an better option moving forward. The Streamer – Though Matt Garza and Corey Kluber are the two obvious names here, they are facing teams that thrive off of right-handed pitching, so I am staying away from these two. I’ll be the first to admit that it is not a good streaming day, but I am taking Tyler Chatwood against the Mets. The Mets have the worst batting average in the league against right-handed pitching, so I am playing the odds and rolling with Chatwood.